It’s October and you still can’t decide which Halloween mask will be the right choice this year? This is the time of year when your artistic and creative site should come alive. So, why not try, and be more creative this year? Choosing the right mask is not always easy, and if you want to raise the Halloween stakes you should probably raise your make-up game too. 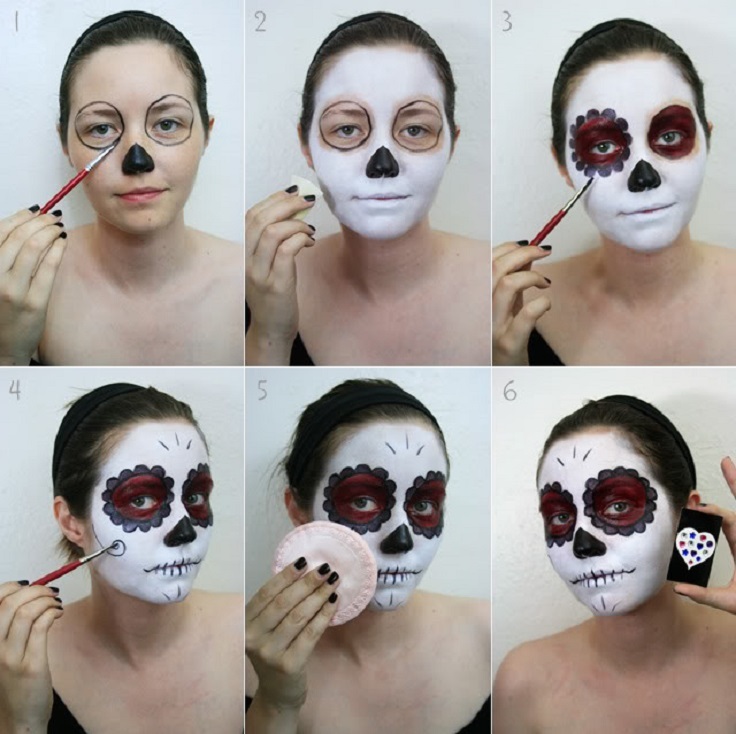 Whether you’re planning to scare the neighbors or you are off to a hot Halloween party, here we present you with ten of the spookiest, and easiest tutorials so you can crack the creepy look. Believe me, everyone will be both surprised and scared out of you. So, that’s the purpose of Halloween, right? Talking about surprised? This make up tutorial will not take to much of your time, although it takes a lot of white powder! Simply, just follow the instructions on the picture above. If you’d like to try this look, then this Halloween is the right time to try it. It is very easy. First you should put some white and orange, over the eyes. Next, apply some eyeliner to the top and lower lash line and some black brush to create a smoky effect. Apply some fake eyelashes,for more dramatic look. Talking about scary? Try to do this really gory, realistic bullet wound on your head, or other part of your body, by just using modeled wax and makeup. Put the circled modeled wax on your face, add some red color on it. Finally, apply more red color, and draw some blood all over the wound, for more realistic look. This is ideal for those of you who want more than your average skull Halloween look, or this is great for as a last minute costume. Although, with so many color options the only limit is your imagination. However, following these instructions, first you must use a black eyeliner pencil to draw a circle around the eyes, and draw a nose. After, you should apply white face makeup or face paint on your entire face. Use the black paint pod and tiny brush to draw the shape of a flower around the whole eye. Fill in with some red paint and set with shadow. Make some final touches. Creepy, right? Draw your chest with white, red and black color. After that, paint some circles around your eyes. Add some rose lipstick. However, this makeup tutorial will give you that supervillain Harley Quinn’s classic look. Add a creepy, seasonal touch to your Halloween makeup with spiderwebs spinning out of your eyelids. However, keep the rest of your makeup neutral to put all focus on the eyes. First you should add a bronze powder on your face, after that, keep the focus on the eyes while drawing it with a black pencil. Add a lip gloss , for a little bit of shine. 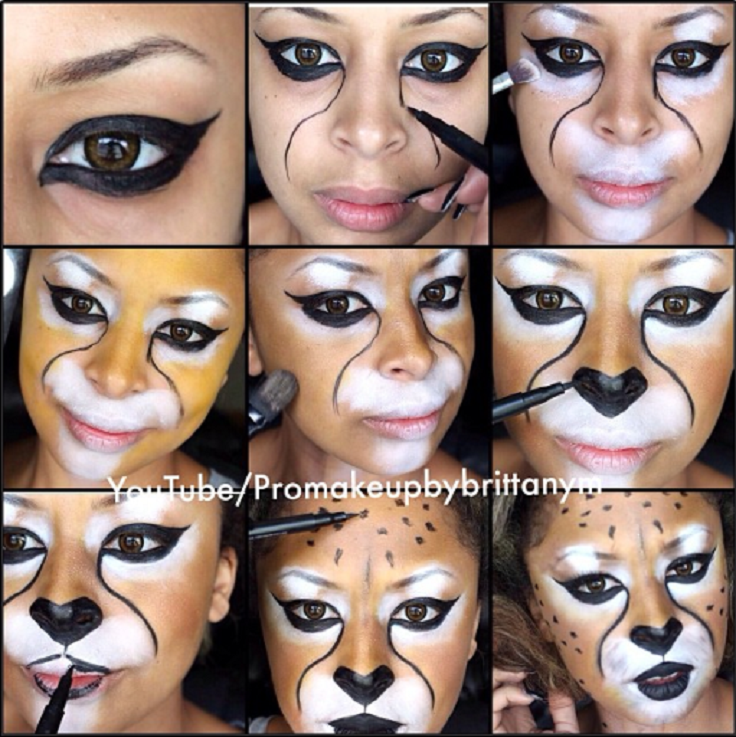 Use this makeup tutorial, and learn how to create a Halloween leopard or cheetah face with makeup.Use a thin brush to paint the black in a ring around the lips, at your nose, eyebrows, and around the eyes. Paint the white at the chin, eyebrows, and around the lips. Paint the cold all over your face and add some final touches with the black brush. Want to scare the living daylights out of all your friends and family this Halloween? Then dress up like a doll, and put this makeup on your face. Use the black pencil and shade to draw this on your face, by following these instructions.